Have you ever noticed that the physical world works in certain ways? Skateboarders use force and motion to perform tricks. If you jump up as high as you can, you'll quickly fall back to the ground. Baseball players use gravity to bring the ball back down when they throw it. When you flip a switch, electricity powers your toaster. Rock bands use electricity to put on a show. The fascinating science of physics helps you understand why forces, motion, gravity, electricity, light, and sound work in predictable ways. 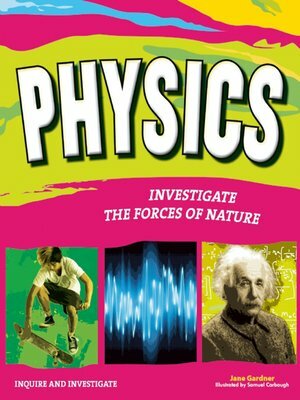 Combining inquiry-based activities with physics topics, Physics: Investigate the Forces of Nature features graphic novel illustrations, fascinating sidebars, youtube links, and a glossary of important vocabulary to illuminate the complex world of physics and bring it to life. Projects include designing a skateboard park that maps the forces at work on the skateboarder and the skateboard, and creating a stage design for a rock band that places electric current where it is needed. Additional materials include a timeline, a list of current reference works, and Internet resources.